The Suzuki DR-Z400S is an incredibly capable motorcycle. I’ve had the chance to ride one the past few weeks and I took it on a 300 mile highway journey, a 200 mile offroad adventure, did multiple days off road, rode it around town, and commuted from Long Beach to LA (about 25 miles) on a regular basis. I found the little thumper to meet or surpass my expecations across the board and miss the little guy after giving it back a few days ago. The Suzuki DR-Z400S is a 398cc, single-cylinder, dual-sport motorcycle. The bike’s 4-stroke engine is liquid-cooled and produces 31bhp at 7600 rpm and 29lb/ft of torque at 6600 rpm. It’s tall, with a seat height of 36.8 inches which helps give the bike 11.8 inches in ground clearance, with an overall length of 90.9 inches and an overall width of 34.4 inches. The DR-Z400S uses a single-disc brake at both front and rear, has a 5 speed transmission, and weighs just 317 pounds. The current 2013 model that we had was unchanged from the previous years. I have always enjoyed 250cc dual sports and was anxious to see how the DR-Z would compare and it was just enough in all the right places. The slight weight gain is unnoticeable and the engine profile feels very similar until you get to freeway speeds, when a 250 struggles to increase a single digit on the speedometer, the DR-Z keeps pulling well up into the upper 80s. I am also used to feeling very unconfident at speed or in turns on most dual sports, but the DR-Z, with the help of the stock Bridgeston Trailwing tires, I felt fantastic and had complete confidence doing either. The height and width of the bike made it ideal for 7:00 am traffic on the 405 and I found myself catching dudes on sportbikes, cruisers, and police bikes with ease because I had such an easier time manuevering through traffic. I had plenty of power to pull away from lights ahead of traffic and to keep up on the freeway in the fast lane. 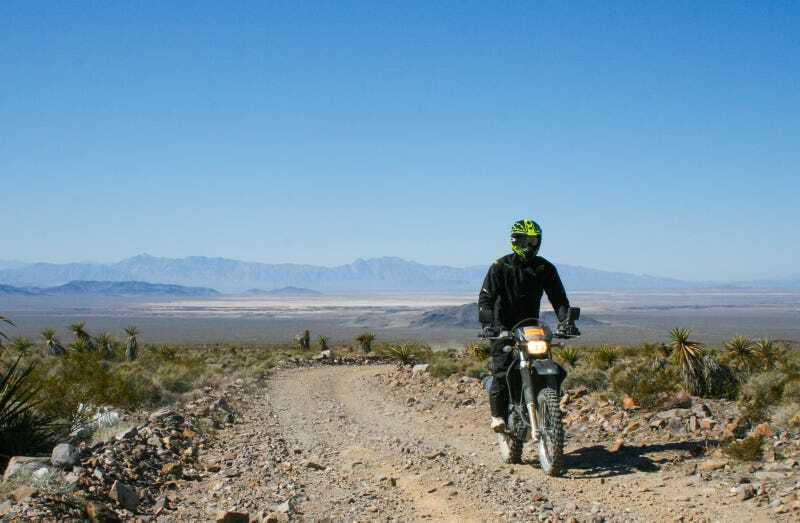 For the Taste of Dakar, I switched the Trailwings for Dunlop D606 dual sport tires which gave me speed wobbles on the 300 mile ride to Pahrump, Nevada, but were excellent once we got there. With those new tires and a few minor adjustments to levers and things, the bike performed beautifully in the dirt. During the first day, Wes and I did the Jimmy Lewis Off-Road School and the same bike that sat on the freeway the previous day for 5 hours was able to out perform the “big” adventure bikes at skidding, sliding, stopping, turning, and lofting drills. The following day during the Taste of Dakar ride, the Dr-Z400S was perfectly suited for all the sandy roads, whoops, and rocky terrain I could throw at it. The DR-Z400S, like many other stock motorcycles in their stock form, needs a little work. The seat is terrible and you can feel the plastic pan underneath it through the thin padding. The handlebars are far too short for my height (6’1″) and left me hunched over for all of the off-road riding. The headlight was not terrible, but is something I would improve if I owned the bike. The stock Trailwings are wonderful for paved roads and will get you down hard packed fire roads just fine, but are miserable for any real off-road riding. These may be deal breakers to some of you, but these are things most people look at changing anyways and I would almost rather have to fix them myself than I have Suzuki do it all for me and then charge me for the costs of a redesign. My biggest surprise was that the fuel economy was so much worse than the 250cc motorcycles it most often finds itself in competition with. I averaged 45 or so mpg (far less when following Wes on a NC700x up the 15) and the Yamaha WR250R gets 70mpg. Paired with a 2.6 gallon tank (including reserve, I was averaging 1.8-2 gallon fillups) I was stopping for gas about every other day on my commute (and 4 times between here and Nevada). For my limited abilities, the DR-Z400S was more than adequate, but if you are serious about off road riding, the suspension could definitely be improved. The brakes on it definitely needed to be upgraded, especially for street use, but were fitting for an intermediate rider off road because they didnt lock up very fast and were forgiving in the dirt. The 2013 DR-Z400S has a suggested MSRP of $6,500. The lighter Yamaha WR250R retails for $6,700 but makes less horsepower and torque. The new 2013 Honda CRF250L has a suggested MSRP of $4,500, but it weighs the same and only makes 18bhp. If you look bigger, the Honda XR650L retails for $6,700 but it weighs 30 pounds more while making similar power to the Suzuki. While we’re at it, the KTM 350 EXC-F is 80 lbs lighter, retails for $9,700, and makes 45bhp while coming pretty much all-sorted for serious off-roading, if sacrificing on-road ability in the process. One of the faster guys at the Taste of Dakar had a 2010 DR-Z400SM, converted to dirt, and he said he had to do a lot to it to really get everything out of the engine and improve the suspension and brakes and handling. When I asked him what modifications were important, he said most guys did a 3×3 carb mod, upgraded to JD jets, added exhaust, installed a kickstand switch and removed the charcoal box so the overflow would’t run into the exhaust lines and flood the engine. Riding off road sloshed gas around in the tank (the legal reaosn for doing this mod). He personally had also completely upgraded the suspension and brakes. While a bike like the KTM retails for a lot more, it already comes with the highest grade components and doesn’t require this level of modification making them equally priced (assuming you are the type to take it this far). If this whole section has left you confused, welcome to the club. If the NC700X isn’t my next bike (because seriously, what could be more practical) this is the conundrum I find myself in as well. Riding the DR-Z400S around me made me realize that I would never enjoy motorcycling more than one of these light litte bikes, with a set of wheels for the road and a set for the dirt. I may just get the NC so I don’t have to try and deal with all the hassle modifying the bike so extensively will bring. Overall, the Suzuki DR-Z400S is a wonderful motorcycle and is equally at home in the dirt or on the road. While I used it for a lot of commuting, I probably wouldn’t buy one if that were my main type of riding. I could see someone buying this for 100% city riding, 100% dirt riding, or anywhere in between. The DR-Z400S is a widely applicable and cheap platform that, with some work, can be turned into a an urban destroyer or dirt devil. That said, its dirt abilities are definitley more “I can tackle anything” than “I can race in anything” so if you’re an off-road expert, I would limit your expectations for this bike in comparison to the more expensive, “race-ready,” KTMs. Plan on putting some money and time into the bike to get it just right, and make sure you swap those Trailwings before getting dusty.